The development of the "Khotislavsky" open cast in the territory of the Republic of Belarus for many years has been the subject of discussions on its possible impact on the adjoining territory of Ukraine. The urgency of these studies is confirmed by numerous scientific opinions of famous experts regarding the possible negative impact of the development of a open cast in the territory of Volyn Polissya including the territory of the Shatsk National Park. In the process of research the hydrogeological conditions of the territory of Volyn Polissya were analyzed.At this the conditions for the formation of water resources of the zone of active water exchange, the hydrological conditions, the state of surface water streams including the reclamation facilities, and the modern water-ecological condition of the defined territory were determined. In addition based on the analysis of the hydrodynamic conditions of the main aquifers the filtration schemes of the surface and groundwater interactions in this area have been developed which allowed to create a model for water exchange of surface and groundwater in modern conditions. The purpose of the research is to evaluate the impact of the development of the sand and chalk deposit "Khotilslavske" (Republic of Belarus) on the hydrogeological and hydroecological conditions of the territory of Ukraine with in the Western Polissya including the territory of the Shatsk National Park. In this case analytical methods of calculation of processes of geofiltration and methods of mathematical modeling were used. In addition the analysis of the validity of the projected calculations and modeling the impact of the open cast in the territory of Ukraine performed by the Belarusian side and the comparison of data have been carried out. The water inflow to the open cast is formed at the expense of the natural resources of the main aquifers and atmospheric precipitates and in the case of hydrodynamic schematization, it can be considered as a radial flow to a well with a large diameter in an unbounded area of filtration with put on the contour of the open cast the corresponding boundary conditions (values of water intake or constant levels on the contour of the open cast). Proceeding from the foregoing one can consider the problem of water flow to a large diameter well in a three-layer aquifer unbounded in the plan with no flow through the bottom and with infiltration influx. We have carried out calculations of groundwaters level decreasing in the territory adjacent to the open cast by the end of 2009, 2013, 2015 and 2016 according to the data of the Belarusian side on open cast water uptake. The analysis of the calculation data and the data of the observation wells indicates that there is a sufficient agreement between the data of calculations and regime observations, as both regime data and estimated data show almost the same drawdowns in ground water levels at a distances of 7.0-7.6 km from the open cast as of 2016. The comparative characteristic of the obtained data allows us to assert that for the given schematic conditions in the zone of possible influence of the operation of the open cast the developed calculation models are reasonably reflect the process of changes in water exchange in the territories adjacent to the open cast. Thus the analytical calculations and simulations have shown that the development of the Khotsyslavske sand and chalk field for the projected period of operation by 2040 will significantly change the hydrodynamic conditions in the Volyn Polissya and in general will aggravate the hydrogeological and ecological situation in a certain area. 1. Bochever, F., Garmonov, I., Lebedev, D., & Shestakov, V. (1965). Osnovy gidrogeologicheskikh raschetov [Foundations of hydrogeological calculations]. Moscow: Nedra. [in Ukrainian]. 2. Zaleskiy, I., Zuzuk, F., Melnychuk, V., & Matejuk, V. (2014). Shatsʹke poozer'ya. Heolohichna budova ta hidroheolohichni umovy [Shatskoe lake. Geological structure and hydrogeological conditions]. Lutsk: Skhidnoyevropeysʹkyy natsionalʹnyy universytet. [in Ukrainian]. 3. Kvartsmelprom, RUP TSNIIKIVR, GNPO «NAN Belarusi po bioresursam» (2009). Zayavleniye o vozdeystvii na okruzhayushchuyu sredu planiruyemoy khozyaystvennoy deyatel'nosti «Razrabotka melovoy zalezhi mestorozhdeniya «Khotislavskoye» (II ochered') v Maloritskom rayone Brestskoy oblasti» [Statement on the impact on the environment of the planned economic activity "Development of a chalk deposit " Hotislavskoe "(Phase II) in the Malorita District of the Brest Region"]. Bilorusʹ, Minsk. [in Russian]. 4. Zuzuk, F. (2016). Virohidnistʹ vplyvu rozrobky Khotyslavsʹkoho rodovyshcha kreydy na zapovidni ekosystemy Volyni [Probability of the influence of the development of the Khotilaslavskoe field of chalk on the protected ecosystems of Volyn]. Pryroda Zakhidnoho Polissya. Lutsk, SNU im. Lesi Ukrayinky. 9. P. 3-11. 5. Ilyin, L. (2000). Ozera Volyni: limnoheohrafichna kharakterystyka [Lakes of Volyn: Limogeographical characteristic]. Lutsk: Nadstyr'ya. [in Ukrainian]. 6. Lomakin, E., Mironenko, V., & Shestakov, V. (1988). Chislennoye modelirovaniye geofil'tratsii [Numerical modeling of geofiltration]. Moscow: Nedra. [in Russian]. 7. Metodicheskiye rekomendatsii po raschetam zashchity territoriy ot podtopleniya v zone orosheniya [Methodical recommendations for calculating the protection of territories from flooding in the irrigation zone]. (1986). Kiev: Minvodxoz USSR. [in Russian]. 8. Mokryy, V.I. (2012). Monitorynh, modelyuvannya i prohnozuvannya vplyvu Khotyslavsʹkoho kar'yeru na hidroheolohichni i lisoekolohichni umovy pryrodno-zapovidnykh ob'yektiv Zakhidnoho Polissya [Monitoring, modeling and forecasting of the influence of Khotilaslav's career on hydro-geological and forest-ecological conditions of nature reserves of Western Polissya]. Pryroda Zakhidnoho Polissya ta prylehlykh terytoriy. Lutsk, SNU im. Lesi Ukrayinky, 9. 284-288. [in Ukrainian]. 9. Norvatov, Yu. (1988). Izucheniye i prognoz tekhnogennogo rezhima podzemnykh vod [The study and forecast of the technogenic regime of groundwater]. Leningrad: Nedra. [in Russian]. 10. O monitoringe v rayone mestorozhdeniya "Khotislavskoye" [On monitoring in the area of the deposit "Hotislavskoe"]. (2017). Pis'mo Minprirody Respubliki Belarus' Ministerstvu ekologii i prirodnykh resursov Ukrainy ot 24.07.2017 za №3-10/36 – imo. Minsk. [in Russian]. 11. O monitoringe v rayone mestorozhdeniya peska i mela "Khotislavskoye" [About monitoring in the area of sand and chalk deposit "Hotislavskoe"] (2016). Pis'mo Ministerstva prirodnykh resursov i okhrany okruzhayushchey sredy Respubliki Belorus'. Minsk: №13-11/3536-vn 27.12.2016. Minsk. [in Russian]. 12. Oleinik, A. (1978). Fil'tratsionnyye raschety vertikal'nogo drenazha [Filtration calculations of vertical drainage]. Kiev: Naukova dumka. [in Russian]. 13. RUP «TsNİİKİVR» (2009). Otchet o rezul'tatakh provedeniya otsenki vozdeystviya na okruzhayushchuyu sredu dobychi mela na uchastke mestorozhdeniya «Khotislavskoye» v Maloritskom rayone Brestskoy oblasti. V 2-kh knigakh. Kn. 1. Otsenka vozdeystviya razrabotki mestorozhdeniya mela «Khotislavskoye» (ÍÍ ochered') na gidrologo-gidrogeologicheskiye usloviya prilegayushchey territorii. Ministerstvo prirodnykh resursov i okhrany okruzhayushchey sredy Respubliki Belorus' [Report on the results of the environmental impact assessment of chalk production at the site of the Hotislavskoye deposit in the Malorita district of the Brest Region. In 2 books. Book. 1. Assessment of the impact of the development of the Chotislavskoye chalk deposit (Stage II) on the hydrological and hydrogeological conditions of the adjacent territory. Ministry of Natural Resources and Environmental Protection of the Republic of Belarus]. Minsk. RUP «TsNİİKİVR». [in Russian]. 14. Zuzuk, V.F. (2014). Pryroda Zakhidnoho Polissya, prylehloho do Khotyslavsʹkoho kar'yeru Bilorusi [Nature of Western Polissya adjacent to Khotyslavsky's career in Belarus]. Lutsk: Skhidnoyevropeysʹkyy natsionalʹnyy universytet. [in Ukrainian]. 15. Romashchenko, M. I., & Bakhmachuk, Yu Y. (2004). Formuvannya rezhymu pryrodnykh vod rayonu Shatsʹkykh ozer v suchasnykh umovakh [Formation of the natural waters regime in the Shatsk lakes district in modern conditions]. Kyiv: Ahrarna nauka. [in Ukrainian]. 16. Shestopalov, V., Sitnikov, A., Lyalko, V., & Pashkovskiy, I. (1988). Vodoobmen v gidrogeologicheskikh strukturakh Ukrainy. 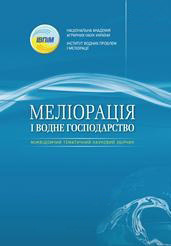 Metody izucheniya vodoobmena [Water exchange in hydrogeological structures of Ukraine. Methods of studying water exchange]. Kiev: Naukova dumka. [in Ukrainian].